The Great British Weather Holiday Packing Palaver! Ahhh....what a dilemma our great British Summertime weather presents us with packing wise! It's certainly a lot more challenging than packing for a holiday when you know you are going to be jetting off to some guaranteed sunshine! I am about to share what I took with me for a week in Devon, it started off so promising, this is a picture of our home for the week at Hillfields Village in Dartmouth. So here's what I packed, as you can see I was quite optimistic with some tops and shorts that I could mix' n 'match. A few warmer layers were a must! These were all worn over the course of the week. I could have done with another jacket choice really but I survived with just these two! These Topshop silky joggers were brilliant for travelling there and back in, when comfort was key! I took these two dresses but didn't end up wearing either of them. A few dressier mix' n 'match options, these did all get worn! a bikini in this country to me. I did wear the costume though as we had a hot tub! What did I actually wear out of this little lot....here goes! 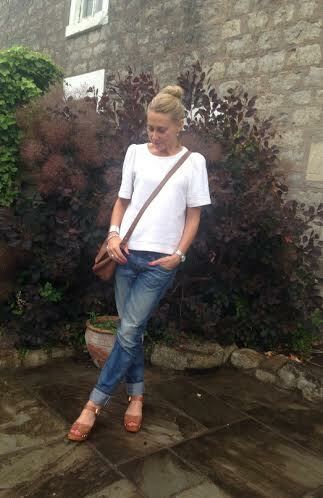 From this little holiday-wear diary I am concluding that I did wear most of what I packed. The dresses didn't get a look in, as the reality of holidays in this country call for much more casual attire for me. I wore jeans on both of my evenings out. The sweater and sweatshirts were must-haves for chilly mornings and evenings! What was I missing....nothing really, I easily managed with exactly what I took though I could have managed with less if truth be told! I did purchase and wear a Jack Wills Breton top.....I can't resist a little treat whilst I'm on my hols! I also snagged this little top from Sainsbury's which I tried on a while ago but in the wrong size. Luckily I found it in the Dartmouth branch where they had plenty of sizes left the fact that it was down to £9 in the sale meant it was a no-brainer as it adds a much needed splash of colour to my wardrobe! I would love to hear what everyone else takes with them when they holiday in the British Isles......any tips you care to share would be greatly received as we will be paying Hillfields Village another visit before the year is out! I have tried....and failed with a many pair of culottes! I gave it one last shot with these from Warehouse and struck culotte gold! Finally these nailed this trend for me. At last I found a pair that were the right length and texture, that don't feel too much like workwear and that can be dressed up or down......for all of 15 quid! Happy days! I prefer the fluid look of these, they look like a midi skirt which is great as I have really fallen in love with skirts this season. 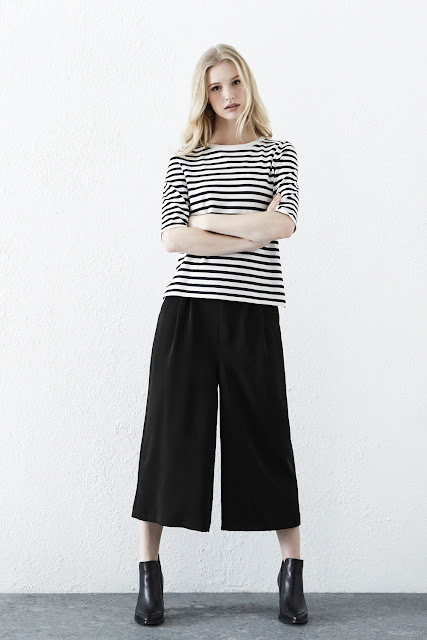 Thankfully it looks as though the culottes are here to stay as I spotted this pic in Grazia, in this weeks issue. That's me done with the sales purchases! I'm looking forward to Autumn now and I'm eyeing up one or 2 things that will ease me through the transitional period. Are you still perusing what's left in the sales, waiting for the final markdowns or are you starting to look ahead at what's on offer for Autumn too? ......I managed to snag in the sales. I wasn't going to look at anything in the sales as I didn't think I needed anything in particular and to be honest the thought of trawling through a heap of sales stuff on the off chance that I might find a gem has held no appeal for me. But I've had a little success with some online sales shopping though. I had the idea in my head of the idea of a couple of wardrobe up-daters. These are on-trend items that I may be a bit late to the party with but that have brought a smile to my face and given my wardrobe a new lease of life! Even if I only wear them for them next couple of months I won't be out of pocket as they were complete bargains. I'm still removing items from my wardrobe on a weekly basis (I've shown another 8 pieces the door over the past 2 weeks) so I don't feel I'm over- loading myself with stuff either but I've had my sale fix! I admit to being heavily influenced to buying this Warehouse off the shoulder top after seeing something similar on the lovely Eve's post here. Eve also inspired my next purchase. I tried these ASOS Maddox jeans in black before back here but sent them back. However when I saw her in these Zara crops here I tried to track them down in my local branch but ended up ordering the Maddox again in blue denim as they were down to £10.50 which I could justify if I only end up wearing them a handful of times! Ta-dah! Here they are styled together but the real beauty of both these bits is that they go with a multitude of what I've already got! Now I've been rather slack at pulling the blog posts together lately so there are a few of outfit pics to share! I would love to hear what you've snaffled in the sales.....have you made investment purchases or have you been like me and snapped up some on-trend bargains?! I am now in the full throes of trying to decide and pack for a week in Devon....just as the weather decides to take a turn for the worse!! Should make for an interesting post.....wish me luck!